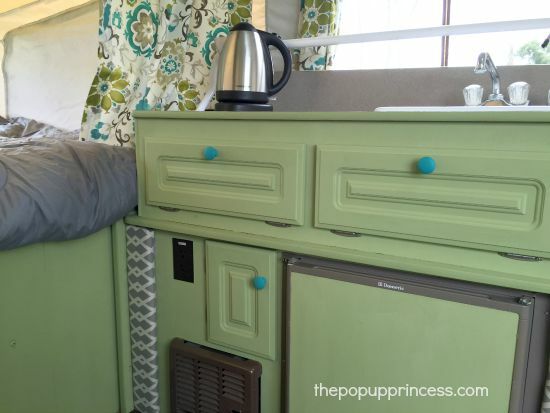 Painting camper cabinets can really make a huge difference in your RV makeover. In fact, it was one of the first things we did on our remodel. You can find the tutorial here. So now that it is done, I get asked a lot questions about this modification. I mean A LOT. 😉 I get it! It is a scary step to take, and once you do it, there is no turning back. So I thought I would answer a few of your questions here and give you an update on how our cabinets have held up five years later. Question: My pop up camper cabinets are not real wood. They seem to be covered in some sort of wood grain printed plastic paper. Can I still paint them? Answer: YES! Most pop up camper cabinets are not real wood. 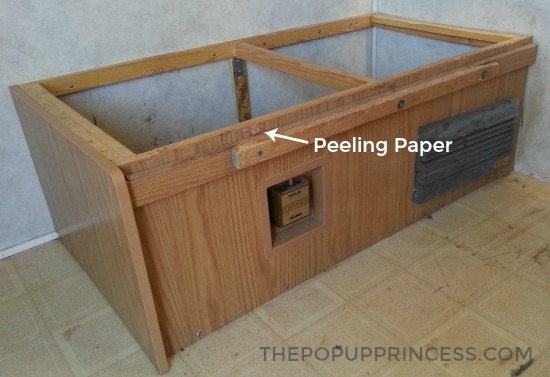 Every Coleman I have ever seen has these paper covered MDF or fiberboard cabinets. Ours was no exception. These cabinets are cheap to make and very light, which makes them ideal for manufacturers. The downside for owners is that they are ugly and don’t seem to wear very well. Our cabinets had some areas where the paper was peeling off, and the only fix was to make repairs and paint them. The key to successfully painting these cabinets is all in the prep work. I’ve detailed our painting process here, but I cannot stress enough the importance of good prep work. It is what will ensure that your paint job lasts a long time. Don’t skimp! Question: The paper coating on my cabinets is peeling and missing in some places. Can I still paint them? How do you fix this? Answer: YES! You can absolutely still paint your cabinets if some of the paper coating is missing or peeling. We did. If I had sections where the paper was peeling, I simply used a little wood glue to re-adhere to paper and covered any cracks with some wood filler. Then I sanded the wood filler smooth. We also used the wood filler–sanded smooth, of course–in the areas where the paper coating was missing completely. Once we painted, you couldn’t even tell where we’d patched. Note: I have heard from some readers who have removed the paper coating entirely, and that seems like a whole lot of work. If you choose to take that route, remember that the MDF underneath the paper coating is rough, and will absorb paint differently. You’ll likely need to apply a few coats of paint and sand in between each coat. Question: Do I have to sand (or prime) my cabinets before I paint? Answer: Well, no… you don’t have to do anything… but I highly recommend it. 🙂 Remember that your cabinets are probably not made of real wood. They’ve got that plastic paper coating on them–and that means paint won’t want to adhere well to it. 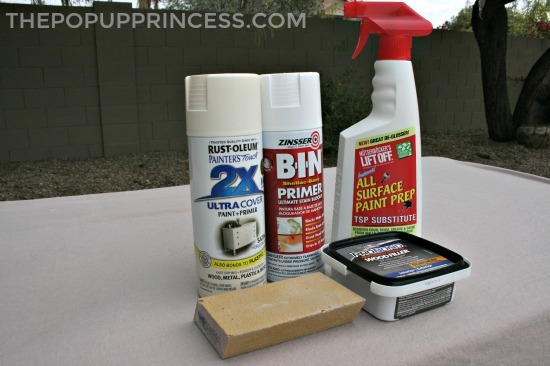 Primer–especially the Zinsser brands I like–is specially formulated to stick to tough to cover surfaces, and it really does make a difference. Sanding your cabinets lightly gives the primer some “tooth” to hold on to, and it will give you a very durable finish when it is all done. 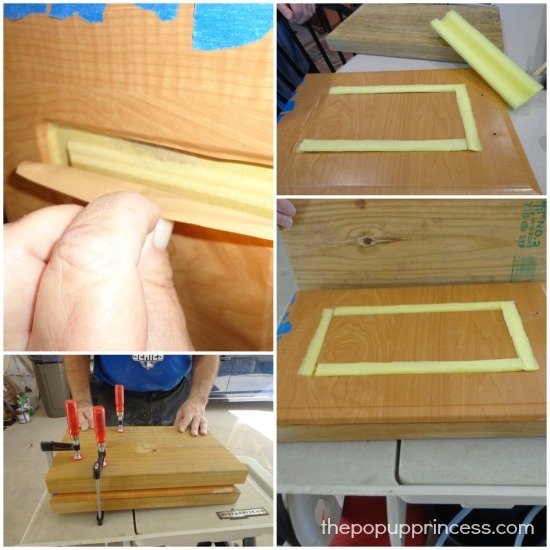 Your cabinets are going to get some abuse, so sanding and priming will make all the difference in making sure all your hard work lasts past the first trip out. Question: Do I have to use an oil-based paint? Can I used a latex paint and primer in one? Answer: You don’t have to use an oil-based paint, but you will get a far more durable finish. Oil-based paints are often used on trim work, because they can withstand abuse. 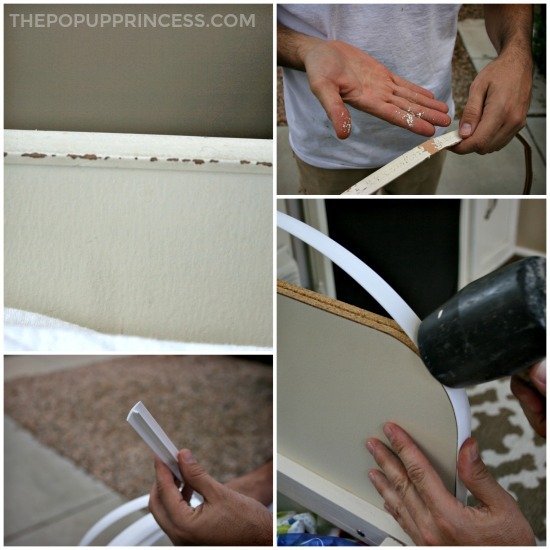 Latex paint makes for easy clean-up, but it is less durable in the long run. 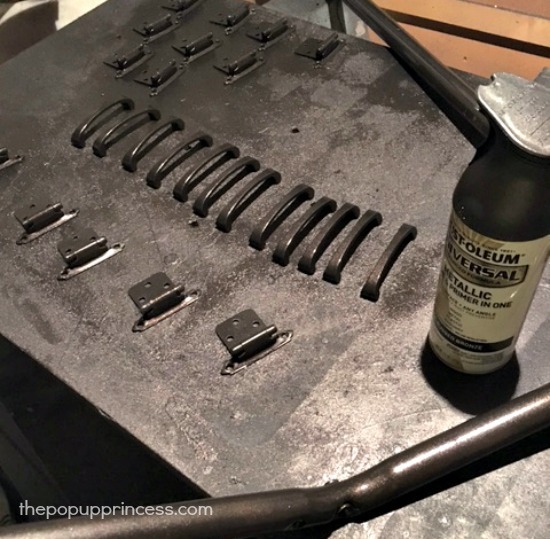 I personally don’t recommend using a latex paint in primer in one, but I’ve featured several reader remodels that have used that type of paint. Sometimes I hear back from the reader that the paint didn’t hold up very well a year later. Most of the time, though, once a reader is featured, I don’t hear back from them. I have no idea how their paint has held up, so I can’t recommend it. I can tell you that OUR paint job still looks a lot like it did on day one. Question: Can I use chalk paint? Answer: Chalk paint sounds so easy, right? It comes in amazing colors, and you don’t even have to sand or prime first! How awesome is that? Felicia used chalk paint in her makeover, which you can find here, and it looks awesome! There is a catch, though. I’ve used chalk paint on a few projects around my house, and while the application and prep work are easy, it does require some finish work. Chalk paint is porous and requires a top coat. Most people finish their chalk paint projects with wax, but you can also finish with a polyurethane. If you skip this step, you’ll have a hard time sealing out the dirt. Felicia sold her camper not long ago, and I was so excited to hear from the new owners. They love their new camper–how could they not? 🙂 However, they did tell me that they will likely have to add a top coat to the cabinets in the future because that chalk paint is just so porous. So, yes, you can use chalk paint and it will look beautifyl if you do it right, but it isn’t quite as easy as it sounds. There is some work involved. Question: Can I paint the plastic trim? Answer: In our camper, it really depended on the trim. We had two types of plastic trim. The first type of trim was the L-trim you see in the above picture. It was basically the corner trim that held two sides of a cabinet together. This trim was made of a hard, inflexible plastic. It held the paint really well, and in three years, we only have the few chips that you can see in the above picture. Since white replacement trim was hard to come by, painting was our best option. We will just touch it up this year. The second type of plastic trim we had in our camper was flexible t-molding. This is the trim you’ll find around your countertops and rounded cabinet edges–like the dinette. This trim did not hold paint well, as you can see in the pictures. It looked great for the first few months, but after our first trip out, it started to chip. The chipping got so bad that we eventually replaced it with white t-molding we purchased off Amazon. You can read all about that in our original painting post here. 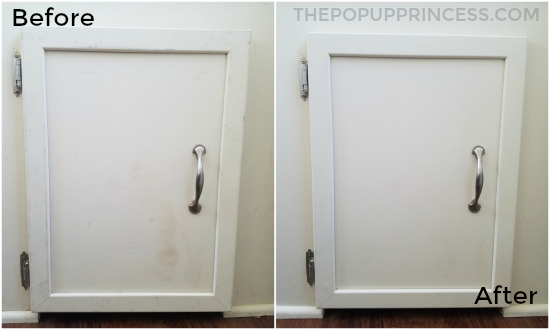 Question: We want to change out the hardware on our cabinet doors, what did you use? The standard drawer pulls at stores don’t seem to fit. Answer: We used some pretty brushed nickel pulls that we found at Lowes. 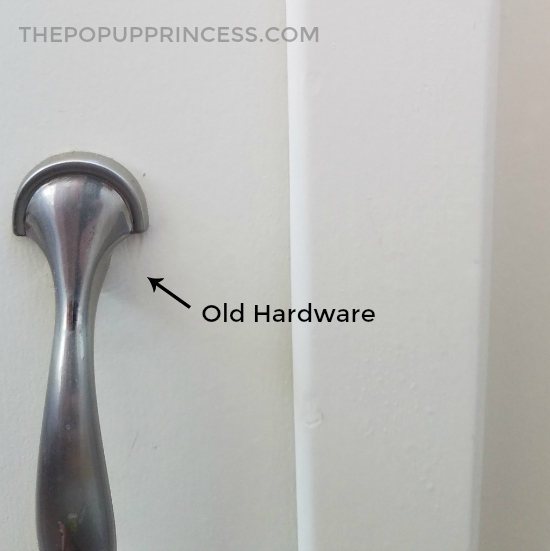 They weren’t the same size as our original drawer pulls, so the holes didn’t quite match up. We just put some wood filler in the old holes and drilled new ones. Once we painted the drawer fronts and installed the new pulls, you could hardly tell. There is a very faint outline from the old pulls (see above) on a few of the doors, but it isn’t really noticeable, especially with the new pulls installed. If you want to avoid that issue, you can always paint the original hardware. 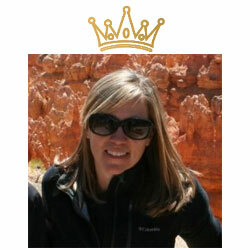 I’ve featured makeovers from several readers that have done just that, and it looks amazing. 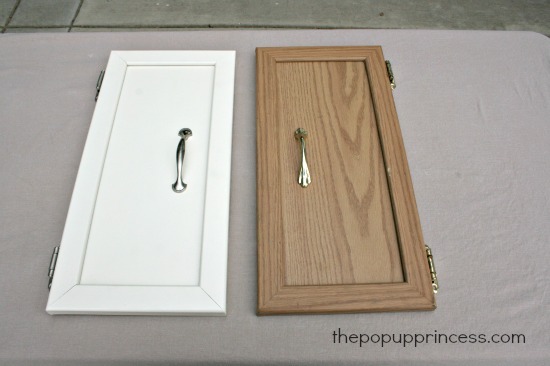 Check out Tiffany’s camper here for a great example of how a simple coat of spray paint can transform your cabinet hardware. Question: I really want to paint my cabinets white, but I have kids. Do white cabinets show all the dirt, and how well do they held up to abuse? Answer: I really love our white cabinets. I’ve got some dark cabinetry at home, and I feel like it shows the dirt far more than our light colored camper cabinets. If the paint chips at all, it is much more noticeable on a dark cabinet. Yes, we have kids, and yes, they have abused our camper a bit. We have traveled over 10,000 miles in this little PUP. We have accidentally packed our dirty dutch oven next to a white cabinet door. I find dirty feet propped up on the camper walls often, 😛 but our cabinets don’t seem to show much of that dirt. We do have to do an occasional wipe-down with a Magic Eraser to remove smudges, but I feel like we would have done that regardless of the color. Once a year, we do our annual spring cleaning, and I really give the cabinets a good scrub down. You can see a before and after picture I snapped last week during spring cleaning. There was a year’s worth of grime in the camper, but it cleaned up so easily. I’m very pleased with how well our cabinets look three years later. If I ever do another PUP makeover, I would go with white all over again. Everyone is different, though, so if you feel like white is a risky color for your family, there are so many other great colors to choose from. 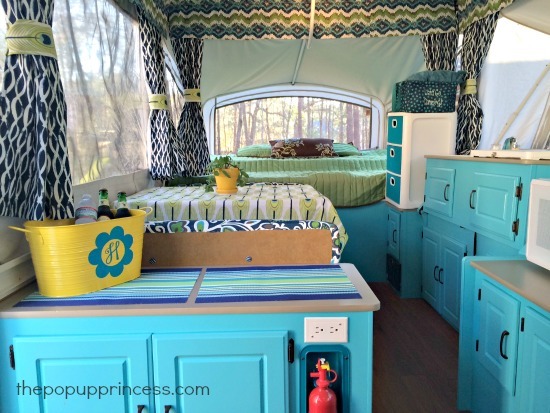 Check out Heather’s pop up camper makeover here for a great example of a fun, colorful cabinet makeover. There are no neutrals going on here! Question: Now that it has been a few years since you painted your cabinets, how are they holding up? Answer: Beautifully! I snapped a picture during spring cleaning to give you an idea of just how great they look after three years. Yes, Mr. TypeTwoFun gave me a whole lot of grief for the bowl of willow balls, but it was totally worth it. 😉 After five whole years of camping–two years after this photo was taken–they look exactly the same. The cabinets don’t look a whole lot different than they did when we first painted them. I’m not going to lie to you. Painting the cabinets was a lot of work, but I feel like it made such an impact in the remodel, that it was totally worth it. Because we didn’t skimp on prep work or painting, our hard work wasn’t in vain. I would do it all over again in an instant. If you are on the fence about painting your cabinetry, don’t be scared. I can assure you that if you do it right, it will look amazing. I think that answers most of the questions I get asked on a regular basis. If you didn’t see your question answered here, feel free to post it in the comments section below! This is great! You mentioned the option of painting hardware, but didn’t say if it holds up. I’m super curious about that! One of the other things i am always leery about with the makeovers i see here is the stick down flooring. With the extreme temperatures campers are exposed to, i worry about the adhesives failing in a few years. This is the main reason we went with vinyl flooring on a roll. But i’d be curious how the peel/stick flooring is holding up 5 years later! I want the answer to this as well! I am just finishing up our cabinets and hardware. I chose an oil based paint and primer in one from Lowe’s and it’s working beautifully. I have done two coats so far and it looks great. There should be only touch ups left when I’m done. I did chose to spray paint the hardware, but I’m wishing I had filled in the holes and started over as I found some beautiful pulls. Loving your blog as a guide! It has been so helpful as we just bought a 2003 Coleman Niagara in January. We’ve taken it out twice and we are starting to get the hang of it! I want to paint so badly but the slide makes it impossible to reach everything. Has anyone painted their Bayside? We have a Niagara. I just finished painting the cabinets. I have left the spots by the slide “as is” and it isn’t even noticeable. Everything else looks so bright and nice that you don’t notice those two small areas. One day, it might bother me, but not now at all. If it does, I have read on the comments here that you can use a tiny roller to get in the two tight areas. I’m in the process of painting my Bayside right now! I’m planning to paint the one side that I can get to, which is the long bench side. We aren’t planning to pull out the cabinet with the fridge, so I’ll have to just update the molding there and I’ll paint the inside piece that’s facing the dinning set. I’ve spray painted pulls and doorknobs in our house-the paint just doesn’t hold up to something that you touch frequently. Maybe in a camper it is different, but I don’t know. If you’ve got the hardware off and you’re painting anyway, I’d just buy new. Chances are you might have to in the long run. I’d rather do that when everything is torn apart rather than go back and redo it. I do have a couple of painting questions. I have a similar era Coleman. I want to paint the walls, is there any special prep work for that? And, as I’m sure is the same in yours, there is this big mechanism for raising and lowering the kitchen, did you paint that and how? I used Glidden Gripper on the walls to prime them, Jessica. Then I used plain latex paint to give them some color. I did not paint the swing galley bar. I’m not planning on taking my cabinets out when we remodel our Viking pop up, only removing doors & hardware, so I won’t be spray-painting. I have found Zinsser primer & Behr oil-based paint but am wondering if I’ll need to buy a whole gallon. I saw on one post they only used about a fourth of their gallon. I know it is cheaper that way, but don’t think I’ll have need for that much leftover paint. Hello, I’m in LOVE with your blog! We’ve had a pop up camper that my parents bought for us to use and for a while we were sharing it with a couple other people (scheduled weekends etc). They recently gave us ownership of the camper and I started planning all the renovations I wanted to do. My problem though is I store the pup at my uncle’s house and it is not easily accessed when its not in use so I’m limited to actually completing the remodel while we are camping. I was wondering if you had any advise for painting the cabinets while at camp? I figure the flooring will be easy enough to do but to paint the cabinets while we are using the trailer might be a bit difficult. Any suggestions would be appreciated please! Its not a campground we camp in (actually middle of nowhere without any people for miles around us) and its usually with my uncle and extended family who are all eager to help. There are no sinks or facilities where we camp so rinsing things out is into buckets which are hauled out of the woods for disposal later. I’m more concerned with the time frames of things as our trips are usually 2 days and between priming and painting dry times is there any advice on how to keep the cabinets from ‘sticking’ once they’re dry during the curing stages? When we close up the camper there isn’t a lot of air flow to speed the curing process so I’m not sure which paint to attempt? Oil vs latex vs alkyd? 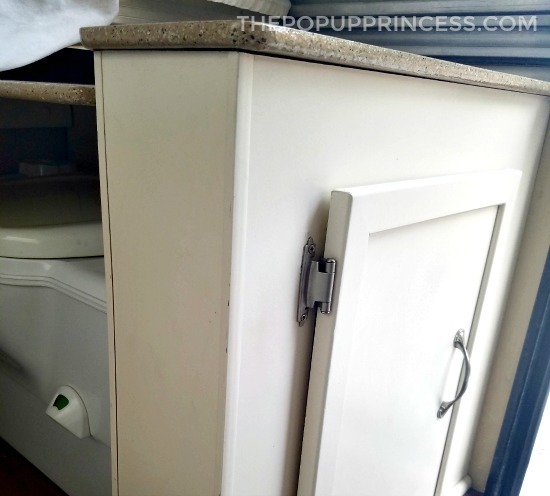 Wondering if you or Mr.TypeTwoFun have any experience with preventing the cupboards from sealing shut while in the camper or if its pretty much best to leave the cupboards off and reinstall them on the next trip? We bought a used jayco popup. The kitchen sink doesnt work (we prefer to use an outside sink anyway) the stove is missing and doesnt have a place for a fridge. (We have a not so mini fridge that we use) the ac unit doesnt work either, so we use a portable unit that we vent out one of the windows. We are starting a remodel of this camper this week. I was telling hubby my ideas. One of the things i would lile to do is lose the sink and cut a cabinet to allow the fridge to stay in the camper (we currently have to remove it to close the camper) since the fridge will be inclosed in a cabinet do i need to have a vent somehow in that cabinet? The All-In-One paint is a flat finish, that will most likely be very hard to clean. 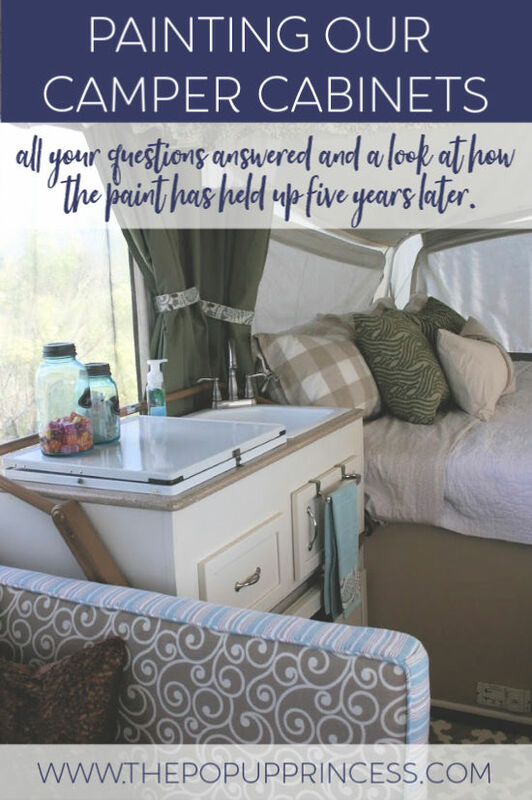 I’m a retailer that sells a chalk paint line and although I’ve painted lots of vintage furniture with it; turning a few into bathroom vanities, I will use an oil base in my camper. With all the moving it will do, the closeness of everything, and dirt from the great outdoors, I’ll stick with non-chalk paint for this project. I usually have to do 2-3 coats of paint and then a topcoat….painting with oil paint I’ll only need two good coats, most likely not a third and that sounds R E A L good to me. Im so inspired by these “pup”makeovers . Just purchased an 86 Rockwood . Inside is perfect just dated . Just so impressed by everyone’s ideas and accomplishments . A little overwhelmed as to what color scheme to go with as I like them all !! Looking forward to getting started on mine . I love all the pictures! We just bought a 2008 Forest River Flagstaff pup. I will follow the great ideas for the cabinets but I’m confused on what to do for the counter tops. What did you use? I’ve been looking at the sand stone paint but I want white cabinets and a darker top but the sand stone is either tan or gray. 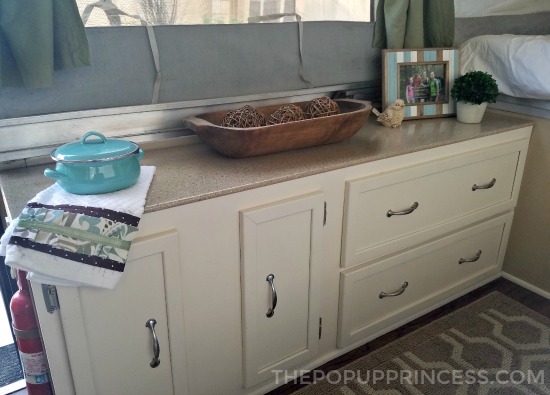 We used Rustoleum’s Countertop Transformations kit. You can read all about it here. I absolutely love how they turned out. My canvas has a couple rips on it, I’m trying to find a good patch kit, which ones do you recommend? We are mid-makeover of our 88 sequoia and I am concerned about my paint choice. I have sanded and prepped and I am using oil based primer and rustoleum satin finished spray. Should I be using semi-gloss instead? Worried about smudges and dirt. Your thoughts? My wife just painted all of our cabinets, but noticed when we were installing the hardware that they were chipping very very easily. She then tried to get a protective coating for them, but it looked horrible. What should we be using to protect the paint from chipping? What a bummer! What type of paint and primer did she use? She used a multi-purpose primer and sealer and a latex paint. I love this website and this post is super helpful. On my list: oil based paint and primer, and rustoleum for the hardware! Has anyone fully replaced the lightweight MDF cabinets with something more durable? Hi Larissa, the plastic film on the cabinet walls are bubbling and so are some areas on the walls. How should I prep these before painting? I love your blog and you have done such cute and functional things!! But I have a completely non-renovation related question. What is the adorable enamel cook pots you have in the pictures?! I love them and even at home you cane never have enough smallish pots! I was inspired by this blog to revamp our “new to us” pop up. I primed with an oil based primer and just painted the first coat of oil based paint. When I’m done, do I need to seal it? I painted it white. We did not, Sasheen. Oil-based paint is very durable and will wipe clean easily. 🙂 Can’t wait to see pictures! Prepping to paint a 2002 Santa Fe. How did you deal with the metal strip on the front of the galley cabinet? Do you have a tutorial for painting the cabinets? Sure do, Jaleesa! You can find that post here. Did you use spray paint (primer and paint color) for all of your cabinets? We just bought our fiat pop up and also live in AZ… I’m trying to decide what type of paint is best for our climate. 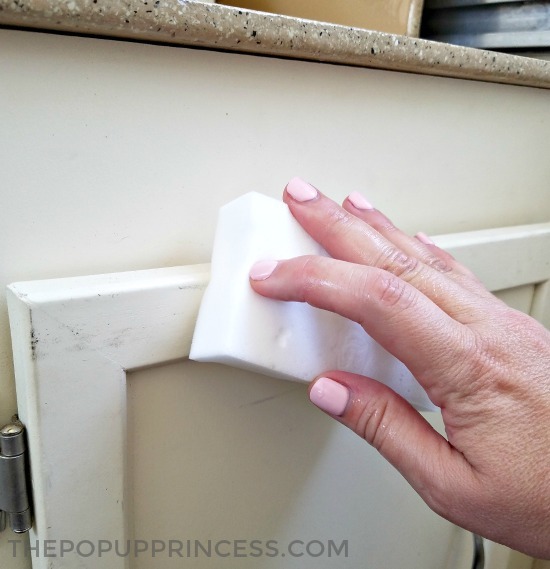 I have done interior cabinets before with latex, but I was considering trying out chalk paint with the wax sealer…. I hadn’t considered spray paint. The spray paint has worked out fabulously for us, Kari. I would do it again (or maybe roll on an oil-based paint) if I was doing another remodel. It does well in the AZ heat. I have heard that the wax sealer can get tacky in hot temps. Maybe coat your chalk paint with a polyurethane instead? Hi! We are looking into painting an RV and I’m wondering if people paint the inside of the cabinets? Or just the outside and have the outside and inside mismatch? We did not paint the inside of *most* of our cabinets. We did paint one cabinet with drawers, and when the drawers slide in and out, it scrapes the paint off the inside. As a result, we usually have a fine powdery white paint on inside our dish drawer. I really wish we would have left the inside unpainted.